These small floating annual plants have no stems but small root systems that need no soil. The plants collect in masses and drift on the surface, and on calm still waters duckweed can form a complete carpet of cover. The green flowers have no petals; they bloom between May and July. If only a few fronds of duckweed are allowed to enter a pond, in warm weather this most rapidly multiplying of aquatic plants can take over vast areas. Ducks keep it under control: they appear to be very fond of it. There are several other species of duckweed, varying in size and shape of fronds. Most have a single root trailing in to water beneath the plant. 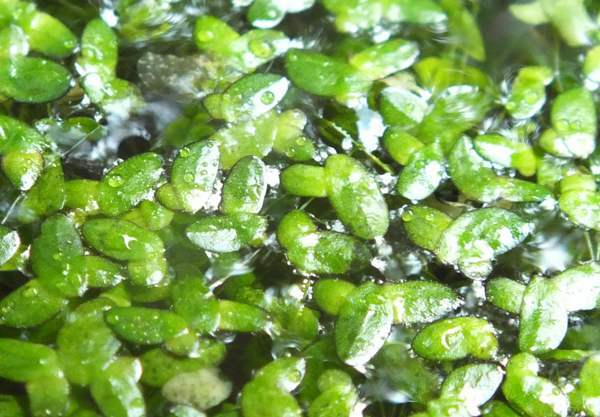 Rootless duckweed, Wolffia arrhiza, is an exception; it is also the smallest flowering plant in Europe, with egg-shaped fronds less than one millimetre across.